The items listed below are a listing of IT related notices. At a glance users can see upcoming, current and recent notifications for campus IT maintenance and schedules plus CUNY Computer Information System (CIS), Blackboard, CUNYfirst alerts and announcements. The CIS notices may affect local users as well as CUNY-wide users. These messages will also be sent to students, faculty, and staff via email broadcasts. Subject: Blackboard content collection issue - February 8th, 2019. Subject: Systems Maintenance – Saturday, February 9, 2019. We apologize for any inconvenience this may cause you and thank you for your cooperation and support. 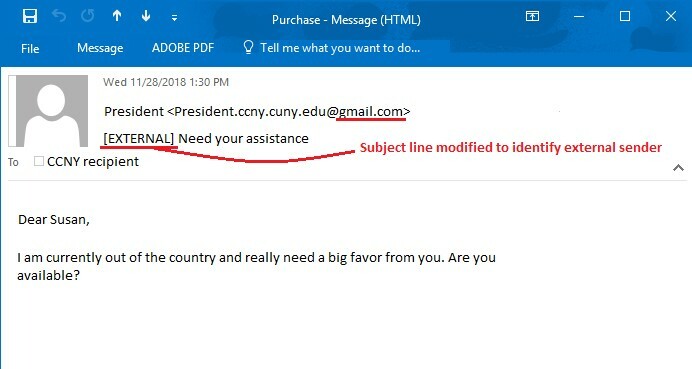 Due to a recent increase in fraudulent phishing activity, including impersonating high-level college employees, starting Friday, January 25, 2019, any messages coming from outside the “CCNY.CUNY.EDU” or “MED.CUNY.EDU” domains will be tagged as “External”. External emails will include the text ‘[EXTERNAL]’ in the subject line, which should help the recipients recognize emails from outside of our domains. Please note that our students’ email service, which is hosted by Microsoft, is considered as external. If you have any question please email our Service Desk at ServiceDesk@ccny.cuny.edu. For more information, please visit https://www.ccny.cuny.edu/it/security. Due to necessary emergency repairs, CUNY will be performing work on its single-sign on system from 11 pm on Friday, January 11 to 7 am on Saturday, January 12. During this time, Self Service functionality (change password, reset password, claim account) and access to all Admissions applications will be unavailable.